Congrats Boys, the TB and EC as well. Just read from Nairobi News that it’s Peter Kenneth who helped facilitate our trip to Madagascar. As fans we need to do more for the team, especially financially. Attending the matches and cheering the team is a good thing but the team has no sponsors so we have to fill that void. It is sad when you see fans putting on Gor t-shirts forcing themselves into the stadium or hanging around the entrances waiting to bribe the stewards to go in and watch their ‘favourite’ team then you fill sorry for the players, TB and the EC. @Dan Original, your sentiments speak volumes about your love for the Team. Like the program that use to be run on KBC called” Ring us Up” to raise money, we must not tire in doing good for our team. And as we work hard, some organization, Company or individual will one day say come what may they will stand with the Team. It is this self belief that made k’Ogalo to strike late in the game and sent their host packing as they sailed in to the next round. We must not lack self belief that we can do it. This resolve to good must not be broken. We can not allow ourselves to go the Efusi way.I therefore agree with you that we need coin to keep our team afloat. In public and in private we must keep talking to our people of the need to pay for all the games. Kombo yasika na Zaiwa mapepe. Thanks bro, but at these moments of great relief and joy how else can I express my appreciation of the miracle in Madagascar? Besides, I am using this opportunity to practice Lingala in preparation for our next trip to DRC to face AC Leopards. There is no question about traveling to DRC with the boys, but now how would I even ask for water, without any Lingala in me? Congrats team, technical bench, executive committee and fans. We return all the glory and honours to the Almighty God for having taken Gor Mahia to the second round. Let us all give our team support at this time when we have no sponsor on board. To all our human waste fans that like making free entry to stadium, shame on you and you have no business going to stadiums if your negative efforts and energies is always to get free forced entry into stadiums. Such fans should instead stay in their houses or better return to uncountry as they have no business in Nairobi. Forced entry is really tarnishing the good name of the club. The club needs every cents in all our home games but no such embarrassing blatant thuggery. We need to educate our fans and supporters to be responsible as well as to offer policing role in arresting hooligans, theft at entry gates, forced entry etc. The club needs every cent please. @JB, our fans are not serious at all. Why do they force entry into the stadium at this time when we every cent counts? These thugs have got no place in Nairobi and they should go back to their counties instead of causing the club misery we witnessed during the Mathare match. This bad habit and manner has to be stopped. Please our fans I plead with you to behave and give the club the revenue we need for the club to move forward. THATS NORMAL THOUGH AM VERY VERY IMPRESSED BY THE TWO AWAY GOALS WE SCORED,CONGRATS.THE REAL TEST NOW IS AC LEOPARDS.IF U GO THRO THEN I’LL DIE BCOZ OF HAPPINESS.CONGRATS BOYS. Yes…I expected it as this year the team has depth. And you know, our league has just started and your yet to see the best from this tea.. Congratulations guys but hit the road running as Leopards are two weeks away! CONGRATS FOR TWO AWAY GOALS U SCORED.THE REAL TEST IS AGAINST LEOPARDS WHICH I KNOW U WONT MAKE. Kozalo Franco Kocha ni Nuttal, Sir Bobby John Ogola, Frank Ouna Mahiaaa…..
Nabiso Kndidat K’Ogalo Mahia, Nabiso Kandidat K’Ogalo Gor K’Ogalo…. Libala yabiso A.C.Leopards…? 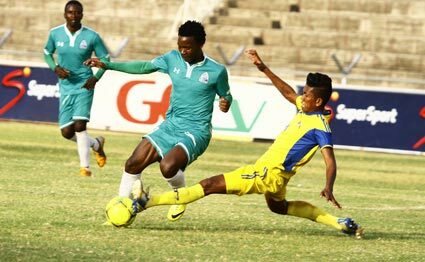 K’Ogalo….Banda sirisee…. @Compressor this song simply reaffirms that there will be a battle royal in DRC, but Gor Mahia will emerge tops with two goals (tiu…tiu!) against A.C Leopards…..and this is prophetic! Ndugu Compressor if this cannot convince then I don’t what else will. We can now build on this and put a real effort in round one. From the Esperance experience last year we know what to expect. We also have to bear in mind the administrative blunder that forces us to make do without some of our best players. I echo sentiments that it is a real tragedy for some “human waste” to continue denying the club revenue by forcing their way into the stadium free. Dignitaries who create opportunities for such people should lead by example by the simple act of alighting from their limousines and publicly paying for their tickets. THIS WILL SEND A LOUD AND CLEAR MESSAGE TO THE HUMAN WASTE BRANCH THAT EVEN THEIR SO CALLED “IDOLS” PAY TO WATCH THE MATCHES. FINALLY GMFC FANS AND OFFICIALS (AND MORESO AKINA INGO OF AFC) MUST REALIZE THAT SPONSORSHIP IS A FOUNDATION BUILT ON QUICKSAND. ECs must provide for membership accompanied with substantial and concrete benefits that separates fans from members e.g privileged entry & vantaged seating for members in addition to discounted tickets for a start. Slowly both these clubs should embark on targeting 10,000 members making an annual contribution of 500bob. To EC why should anyone want to be a member when nothing differentiates a member & a fan or even a hooligan or than being able to vote in elections/AGMs held at the whims of ECs. But AFC have hit another milestone hiring Logarusic when they have no players to be coached talk of putting the cart before the horse ama vipi Ingo. Lost of words…..completely lost I say! Bare foot Bandit let me believe you are not whispering to the Zaireans to tightly watch on “teargas” just joking but the excitement is in the air everywhere. Now we are coming back and play no games Mr Nyamweya? and then just head to DRC for the leopards. People, good people let the matches go on please. Why are we destroying what we have built painfully over the years just by the sheer lack of foresight? Bandeko na ngae Africa mobimba libala Kandidat nabiso Gor Mahia K’Ogalo, nalembi mokolo kokufa. [I want to believe that all I am saying here is something to the effect that every soccer lover in the whole of Africa (Africa mobimba!) knows what Gor Mahia is capable of]. ya solo. Gor ni monene. Congratulations. Going by some of the postings that were made by some of the players, the match was not easy just as it was expected after we watched those guys in the City a fortnight ago.That is what soccer is about. The realization that it had to take commitment, determination and patience. These are characteristics that must be maintained at all times. As we maintain our focus I think we will move slowly but surely. Thank you once again K’Ogalo. A sneak look at AC Leopards – (Athletic Club Leopards) tells us that this is a football club from the Republic of Congo based in Dolisie, Niari. It was founded in 1953 and plays at the 20,000 seater stade Denis Sassou Nguesso. They are nicknamed Les Fauves de Niari (The beasts from Niari). Their Chairman is Remy Ayayos Ikounga while they are coached by the Belgian Patrick Aussems.They have the Congo Premier League 2 (2012, 213), The Congo Cup equivalent GOTV SHIELD- 4 (2009, 2010, 2011, 21013). They have won 1 Super Cup and 1 CAF CC (2012). They have played a total of 37 matches in CAF Competitions winning 16, drawing 10 and losing 11. They have scored 59 goals while they have conceded 47. They wear green tops, white shorts and green socks for home colours while they adorn white tops, green shorts and white socks during away matches. They won the CAF CC in 2012 beating Djoliba of Mali 4:3 aggregate in the Finals. They won the first leg of the final 2:1 while they drew the return leg 2:2 in Mali thus winning the title on 4:3 aggregate. They have been regular participants in CAF Competitions since 2010 gaining favorable results. They are very hard to beat at home and occasionally do get some very eye catching away results i.e. when they beat CS Sfaxien of Tunisia 2:0 away in Round 1 of CAF CC of 2011 having lost the home leg 1:2 to Sfaxien. At home, they have beaten almost all the African heavy weights in the CAF competitions save for Al-Ahly of Egypt who beat them 1:0 while they lost the return leg 4:1 in Egypt during 2013 CAF CL group stages. Among the teams that they have beaten in the past are: Cotton Sport of Cameroun, Cs Sfaxien of Tunisia, Heartlands and Kano Pillars of Nigeria, Orlando Pirates of South Africa, Al- Merreikh of Sudan. In 2014 CAF CL, they beat Primeiro de Agosto of Angola 4:1 at home and lost the away leg 0:2 in the first round thus qualifying for 2nd round. They bowed out in the 2nd round on away goal rule after drawing 1:1 at home and 0:0 away to Al- Hilal Omdurman of Sudan. They had 5 players in the Congo squad for 2015 AFCON in the name of Chansel Massa Mohikola (GK) defenders Titon Moubhio Ngougnga, Davy Dimitri Bissiki Magnokele and Midfielders Sagesse Babele and Cessair Gandze. They were given a bye to this round (round 1 proper). Good piece and good job sir, Le Pastre (and Pmawego too). Now use your sleuth’s skills and get us their weaknesses and their strengths. Get us the formations they prefer and the ones that have enabled them to perform so impressively. What are some of their lowest moments and where are they most vulnerable? We need to expose this beast as much as we can so as to eliminate the surprise element and fear factor. I am very happy for BB for scoring the winning goal and i hope the goal will propel him to score more. Iam extremely passionate about this club ,I love and savors every triumph. Let me tell that the way Nutal is molding this team and the way in which these players are responding makes me very proud, indeed make no mistake unless we suffer some sort of disaster, this team is going to be deadly and dangerous. Watch out efusi,@Agrippa where are you? I personally think playing kevin oluoch in right back and walusimbi in lef back is a disaster …..and so is having musa mohammed in central defence. I think the coach needs to tinker with hi s back four when we play AC leopards ‘efusi ‘ and have musa mohammed in left back position, dirkir glay and Israel emuge/shakava in central defence and Bernard odhiambo in right back. EC !!! my plea …..
ALL THE GLORY TO THE ALMIGHTY GOD!! AND KUDOS TO THE BOYS!! How many games to the group stages?